Bread is the staff of life. Or so the saying goes, right? Bread is one of the most common foods the world-over, appearing on every kitchen counter or dining table at some point during the day, and it comes in a wonderful variety of forms – one of which, is spelt bread. 1 What is Spelt Bread? 1.1 Why Has Spelt Bread Become Popular Again? Spelt bread is a delicious wholegrain loaf packed with nutrients. It’s a salty, nutty, faintly sour bread that will satisfy the hungry and keep you from becoming h-angry. In fact, spelt has been feeding people for thousands of years! Spelt grains were being farmed in ancient European and Middle Eastern civilizations and were favored over the (now) common wheat breads, up until modern farming and harvesting techniques came along in the 19th century. Spelt sourdough bread was a loaf found in every household for centuries! Why Has Spelt Bread Become Popular Again? Aside from being scrumptious, spelt bread is ripe with health benefits and pretty easy to make! Though not an entirely gluten-free alternative, spelt bread contains less gluten than common wheat, and can be a good choice for those with food intolerances. Unlike bread wheat and other grains, spelt does not lose a hefty portion of its nutrients during the milling process. This is because most of the good stuff is found in the inner kernel. The health benefits are pretty good too! Richer in protein, fiber, and amino acids than other types of grain, spelt is packed with nutrients. All of the stuff above sounds well and good, but how does one go about baking with spelt? It can’t be that hard….right? Actually, it’s not hard at all! Learning how to make spelt bread doesn’t take years of baking experience! Start with this basic spelt bread recipe below. To combat the faint sour taste of basic spelt bread (which does make for a fantastic spelt sourdough bread) this recipe adds a healthy splash of honey to the dough, making the recipe more palatable to kids and those with a sweet-tooth. 1 cup honey (try maple syrup for a slightly different flavor!). 2 ½ cups spelt flour. As bread will struggle to rise and cook properly if placed into an improperly heated oven, get that oven preheating before doing anything else. Depending on the make and model, aspiring bakers will want the temperature from 300 – 325 degrees F.
Also, grease or butter up the bread pan and set it aside. In a medium or large saucepan, gently heat the milk. You don’t want this boiling like frothed milk for a latte, mind you! The milk should only be warm enough for the honey to dissolve smoothly. Once heated, stir in the honey until combined. Remove from the heat. Add in the softened butter and eggs to this sweet mixture. Mix thoroughly. Add in the flour, salt, and baking soda. Mix it all up, but don’t overwork the dough; the more you mix, the tougher the dough will become. Pour it all into the prepared pan and bake for 40 – 45 minutes. Turn down the heat if the crust darkens too quickly, but try and keep it in the oven for at least 40 minutes. 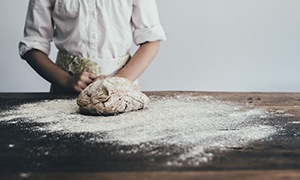 You’ll know when the bread is cooked by either: poking a skewer into the center and pulling it out clean, or tapping the underside of the loaf and getting a nice, hollow sound. Feel like something a little more savory? Then try out spelt cheesy scones instead! They are simple, satisfying, and great for snacks or packed lunches. Plus, these scones are an easy bake that can be whipped up, cooked, and sitting on the table in under an hour. 2/3 cup grated cheddar cheese, plus extra for topping. Like the above recipe, get that oven preheated to 180 degrees before you even start whacking the ingredients together. Grease up or line your baking trays with baking paper. Put the flour, seasonings, and baking powder in a bowl and mix thoroughly. Cube the butter and pop it into the dry ingredients. Jam your hands in there and rub the butter into the mix. Keep doing this until the mixture looks a bit like wet sand. Add in the cheese and mix it through. Relive those years as a child digging mini-tide pools on the beach and create a well in the center of your mixture. Lightly whisk the egg and milk together, and then pour it into this well. Mix gently with a knife or spatula. It’s important to not overwork the mix. Flour a surface, plop the dough on it and roll it out to a two-centimeter thickness. Using a two-inch cutter, cut out as many scones as possible. Feel free to squish the scraps into more scones, but don’t re-roll the dough – it will make the scones tough and ruin the texture post-bake. Place the scones on the tray, brush them with a beaten egg, and sprinkle cheese on top. Put the trays in the oven and bake for 12 minutes. You’ll know when the scones are done when they are golden brown on top and have doubled in size. The telltale sign of a great scone is the split in the middle! Here’s a video showing another variation of spelt bread. Do you have any tips for making spelt bread?